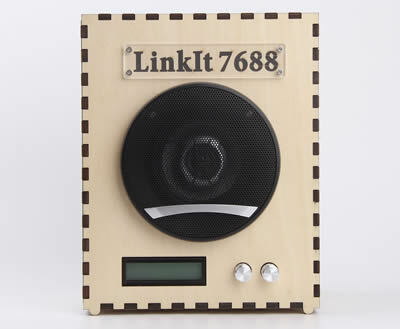 Please consider Breakout for LinkIt Smart 7688 v2.0 as alternative product. Breakout for LinkIt Smart 7688 is a Grove port integrated expansion board for LinkItTM Smart 7688 development board. This breakout board will save a lot of work and makes prototyping easier through simplified wiring. It will assist a beginner to get started fast. It supports serial buses like I2C, UART. It comes with USB, Ethernet and 3.5mm Audio ports. LinkIt Smart 7688 (a compact controller board) is an open development board, based on the OpenWrt Linux distribution, MT7688. The board is designed especially to enable the prototyping of Rich IoT Application for Smart-Home. It is a WiFi Audio which allows your mobile phone to connect to its WiFi and play the music in your phone. If you connect the Linklt Smart 7688 to your Router, the Audio will show the IP on the Grove RGB Backlight LCD, and also the song title. Learn more at our Recipe. Breakout for LinkIt Smart 7688 is a Grove port integrated expansion board for LinkItTM Smart 7688 development board. This breakout board will save a lot of work and makes prototyping easier through simplified wiring. speaker output is enable or disabled by default?